I was hyped for the Celestial Tournament before it was even fleshed out. I knew that there was no way for my excitement, which is on par with my daughter’s enthusiasm for “ice cweem CONE!” to be matched. I prepared to be disappointed because, come on. I was wrong. Pleasantly, at times frustratingly, wrong. The Tournament is well executed and a real challenge for advanced pet hunters. I really, really stress advanced here… the requirement for entry has been lowered to 15 level 25 pets, and honestly after playing it through, 15 seems really low. If you make it through all 7 encounters you’ll likely have a minimum of 21 dead or almost dead pets on your hands. But, let’s not get ahead of ourselves. To get to the Tournament, you can either pick up the breadcrumb quest (I believe it’s an autograb while you’re in the Vale like the previous patches) and do all that Timewalkers malarkey. You could also just fly/swim your happy little self over to the Timeless Isle off the coast of the Jade Forest to the Southeast (it’s faster for Alliance to port in to Paw’Don from Stormwind and fly straight there, ime, but because of the Horde’s portal location in Honeydew it’s roughly even). 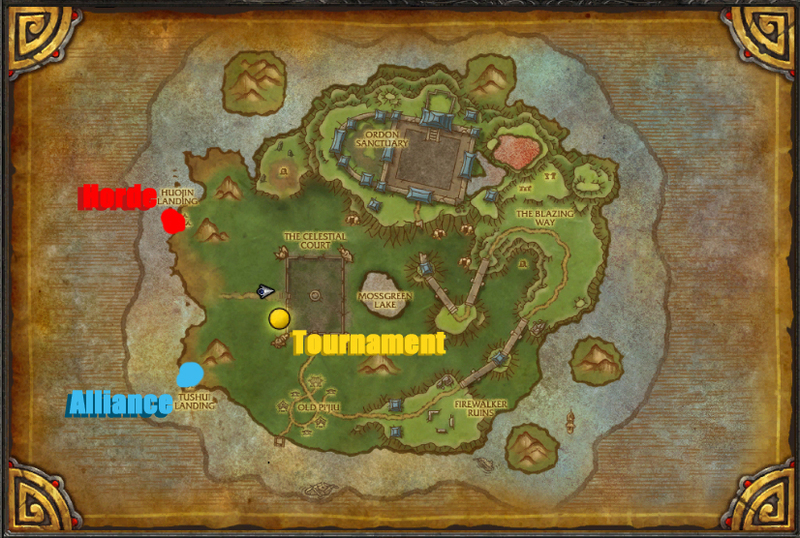 Once you pick up your faction’s flight point and the next breadcrumb, you’ll be referred to the Tournament Grounds. As you come in on the road from the West, there’s a whole lot of non-pet related things to explore. Noodle vendors! Booze vendors! 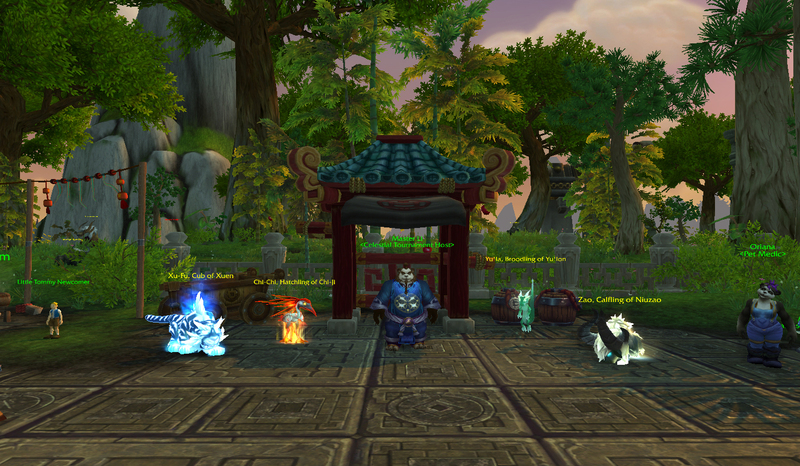 Old NPC friends from across the entirety of Pandaria! Wrathion and Anduin! Psh, this is a blog about pets, y’all need to keep up. 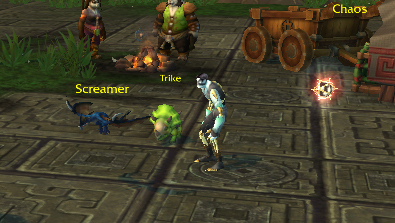 The Pet Tournament NPCS are just to the South. The Tournament itself pits you against 3 NPCs with full, 3-pet teams, and then you fight each of the Celestials in single combat, inside a solo scenario. The current requirement for entry has no quest prerequisite, only a threshhold of a number of pets you need to have at level 25, so if you’re stuck flailing against Major Payne but still leveling up your stable, you can participate. The reason for this 15 pet threshhold is because you may not heal or revive your pets at any time inside the scenario. Even if you screw up and forget to heal before you enter the scenario, not that I have firsthand experience with that or anything. If you leave the instance and rejoin it, your progress is reset to the very beginning and Emperor Shaohao is right there to rub it in your apparently gender-ambiguous face. 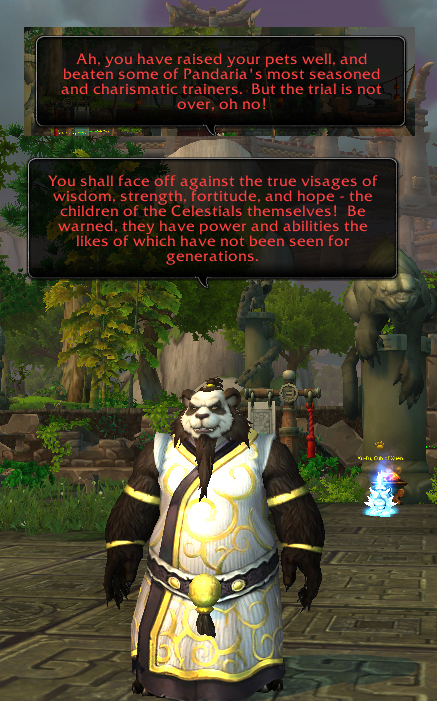 Emperor Shaohao acts as the MC for the whole event, and lays out the rules and parameters as you go, in addition to taunting you about being a noob who had to heal her pets. The 3 teams of trainers are varied, but you face the same ones each time you restart the scenario, so you can gradually plot out a strategy against the 3 tamers you’re facing for the week. In this first week I attempted it, I got to go against the Alliance dwarf with a penchant for pets, Sully, and his erstwhile companion Socks the Bandicoon, who had apparently been resurrected to undeath after being shot by Amber Kearnen. 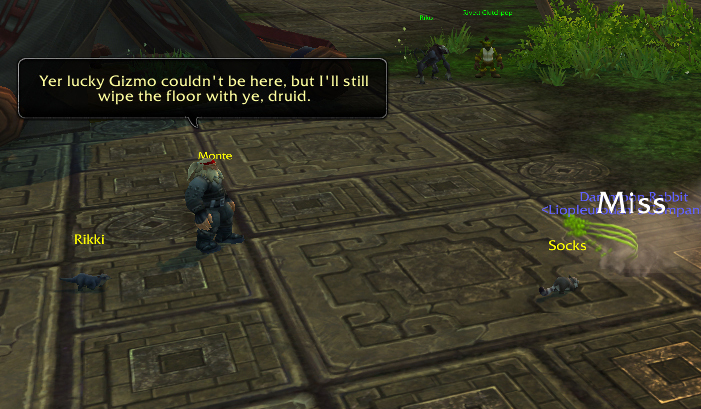 In terms of story and Horde Bias and all that Sully is kind of a silly cartoon character, but he’s a dwarf after my own heart, and I really enjoyed seeing that he leveled his pets (and dragged Socks’ dead body through the whole of Pandaria, apparently, creeeepyyyyy). I also fought Lorewalker Cho, who had virtue-named pets, including presumably the broom you use to sweep up while doing chores for him. The third NPC I faced was Dr. Ion Goldbloom, who had a flying dinosaur, a beast dinosaur and a magic pet I really want, called Chaos. For these guys I was able to mow them down fairly quickly using the old pet family weakness thing, eg a Magic – Mechanical – Dragonkin against Goldbloom’s Flying – Beast – Magic pets. Strategies will be forthcoming I’m sure. This WoWhead post has a few of the other trainer team makeups. 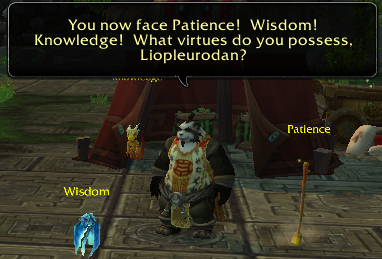 But in any case, when you’re done with that, Shaohao has some more words for you. The first time I tried to play through, right now is when I realized I had a bit of a problem. There are 4 celestials. There’s a Flying, a Dragonkin and 2 Beasts. 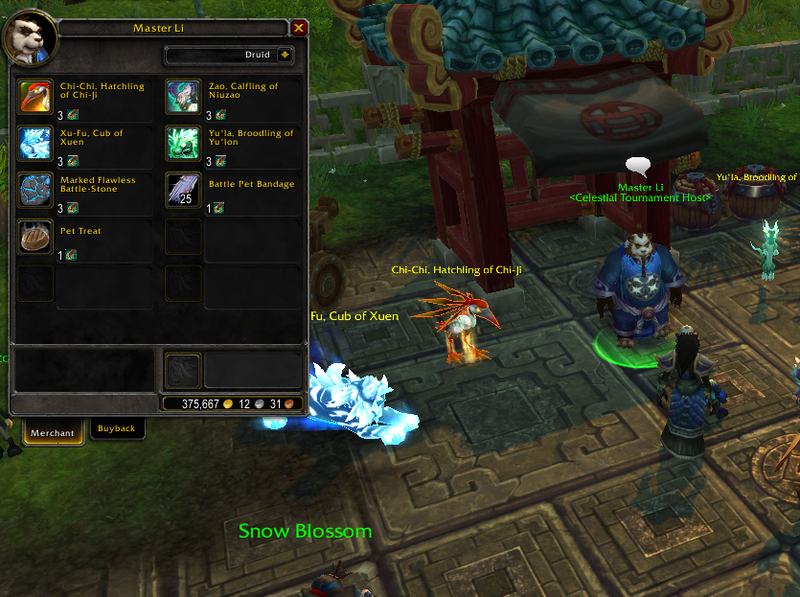 I’d kept a couple of each pet I’d gotten on the PTR via the random system. I didn’t really need, say, 3 Lil XTs clogging up my journal, so I’d been selling them so other tamers could grab their favorites off the AH. So, facing 2 beasts with one of the less populated families, most of which start off as Uncommon anyway? Just a little rough. Juuuuust a little. 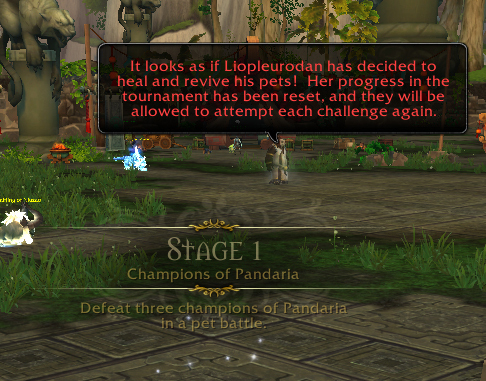 I think I ran through 30, 40, 50 level 25 pets in trying this scenario the first time before giving up. The Celestials are tagged as Boss pets, which not only reduces the damage they take by half, but makes it so they can’t be dealt more than 35% of their health in any one turn. Chi-chi took one look at my roach’s Apocalypse and laughed. At this point it’s too new for me to give out any concrete strategies, and they’re still doing tweaking on the encounters so the particulars aren’t too solid yet anyway. 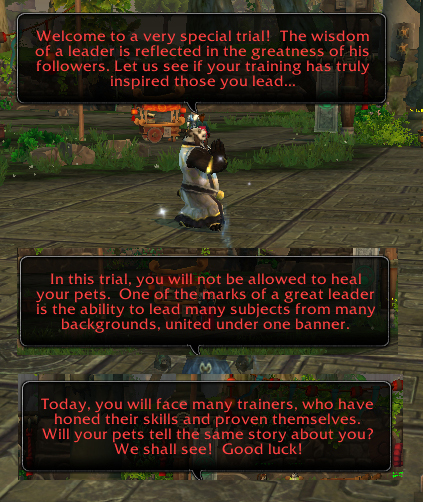 I will say though, that I had a lot more success when I made sure to make a *team*, rather than an unconnected jumble of 3 pets. Against Chi-chi, I used a Wild Magic azure whelp, a Disgusting Oozling with 25% damage debuff DoTs and mopped up with a heavy hitter Lunar Lantern, even though it was an Uncommon. With that team, I beat him fairly decisively. Previously I’d just grabbed 3 pets with magic damage (I think there was a Coilfang Stalker in there or something) and it didn’t go nearly as well. For me, Xufu was the roughest to beat. Zao and his Wish was rather frustrating, but I countered that by just gradually beating him down and using a huge nuke when I knew he was relatively low. 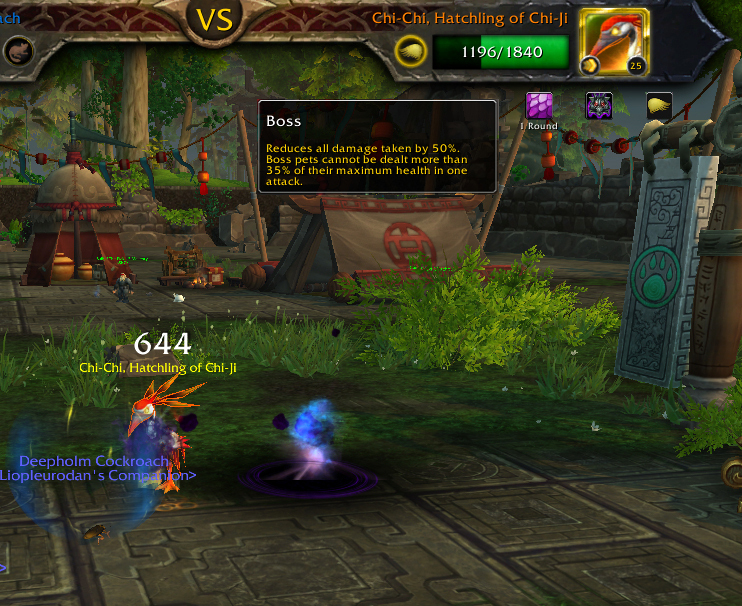 Chi-chi’s constant healing was awful, but he got a tweak so that he’s not always casting Tranquility. For Yu’la I used a lot of Backflip stuns and just beat her down best as I could. With Xufu, he was pumping out such ridiculous damage against my Mechanicals, I decided to swap to my Flyings. I chose pets with some kind of avoidance too, because he also has a moonfire which can decimate a magic-vulnerable Flying. And that swap (especially the avoidance stuff!) did the trick. Overall, you really need to look ahead with your pets choices. I had a lot more success overall when I saved my Mechanical pets to go after the later bosses than I did when I was burning my favorite pets first. You have to exit the scenario to get your reward, from the same place as above. 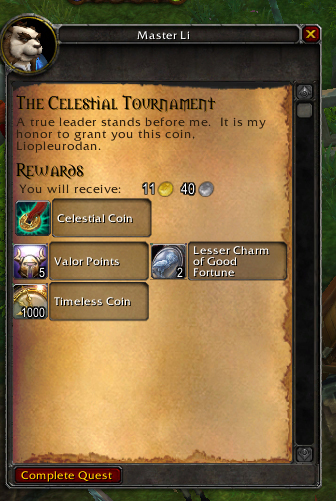 The Celestial Coin is currency you can use to buy new pets, marked upgrade stones, and other nonsense. You get 2 additional coins immediately, so you can buy one of the new Celestial pets the first week. After that, it’s one per week in a slow, slow grind. Personally I’m buying the deliciously bitey Xu-fu first, but hey. I’m going to stress that you need to be ready for this to be difficult. It is (as of this writing, of course) a serious challenge. As always, keep trying and take deep breaths. And then, QUEUE UP! This entry was posted in Uncategorized and tagged 5.4, celestial tournament on August 5, 2013 by Liopleurodon. Ooh, sounds fun! :) “Boss” reduction is 35% per turn, not per attack? (i.e., you can’t cheese one of them with the Valkyr/Water Spirit/Chrominius bit like you can the BoF?) Probably a good thing, as you could do that to three of them. Per attack, so you might be able to. I’ll try to snag a Valk for next reset & report back. And yeah I agree, but I kinda get the feeling that this is supposed to be like, the ‘pet battling’ raid, so a week reset makes sense, sorta. At least it has a better drop rate than Secrets. 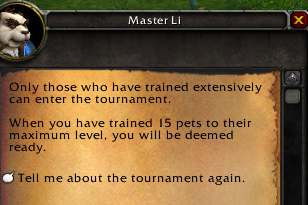 When i first heard the notion of them adding a pet battle tournament, I had visions and hopes for a PvP Pet battle queuing system. 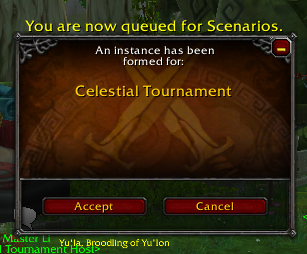 Would have been nice to see 4, 8, or 16 man Single elimination style tournament queueing system, but all we get is an npc tournament? The way it is currently set up it shouldn’t even be called a tournament because its more of a guantlet than a tournament at this point. Meh. I agree to an extent, but the Argent Tournament didn’t really have a PVP angle either, so I think Blizzard just likes to use “tournament” to describe this kind of thing. 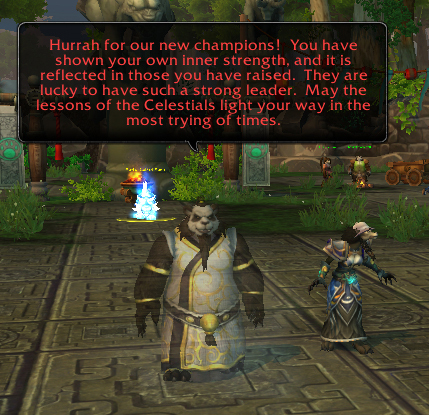 And can you imagine the rending of garments & gnashing of teeth if this were all PVP-related? People were already half berserk over the 15 pet requirement and the Stunted Direhorn pet pvp reward last patch. I do think an Arena-style pet PVP thing (seasons! Mounts?) would be a welcome addition, though I wonder if it would just be that one dude with his lame OP FotM team at the top. Not that that doesn’t happen in Arenas, but hey. – 16 Man, single elimination, best of 3 per match. – Your team is your “entered” team for the first “game” of each match. After that, you can substitute a single pet to your team for the 2nd and 3rd games. Might take a little long to run, would want to shoot for about an hour I think for the finalists. Re: Valkyr – that’d be good to test. If it “works”, probably should report that as it’s way too easy (though getting 3 valks obviously isn’t). 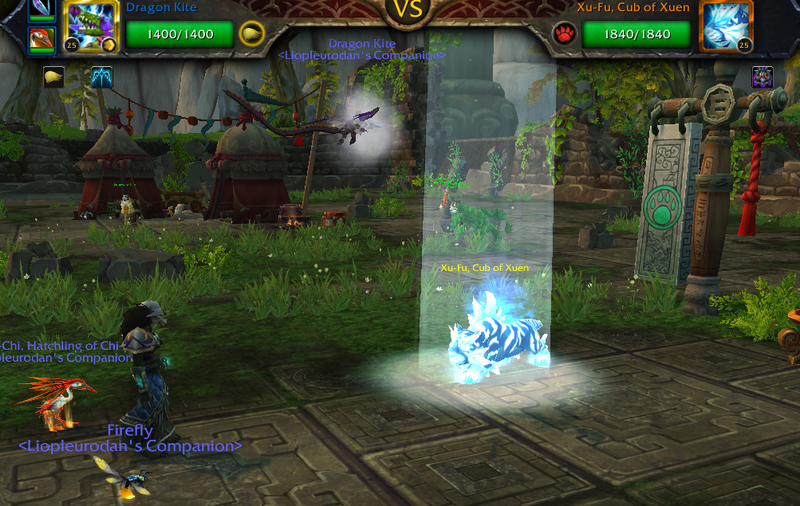 Yeah, we’ve seen the counter (and the counter to the counter etc) pop up with FotM pet pvp. I just think that, with the fluidity of pet swaps (ie, virtually no timesink to get a FotM team comp) that might be more of a consideration for a ladder-type tournament. Don’t get me wrong, a PVP tourney would be super fun and I’d participate a whole lot regardless of whether or not I get beat first match first round. But I’m down with a PVE challenge too, and this was a super fun, slightly frustrating event thinger dealybopper, whatever we’re calling it now, heh. Congrats! I’m so glad to be able to help. I’m so glad you found them useful. Which pet did you pick? Pingback: The Team of Winnarz Actually … Wins? | That Was an Accident!